Ever since he had transmitted the faceting data to Orson and his team, he felt as if he had been running a low-grade fever, with some part of his mind fixed on solving a calculation that was veiled from consciousness. That it regarded the kybers he had no doubt, but the actual nature of the problem had yet to reveal itself. Plagued nonetheless, he had documented his dreams in the notebook. He had long ago mapped the landscape of his subconscious and could usually decipher what his dreams were telling him, but his recent ones seemed to be taking place off the map, set in unknown regions of his mind. The dream journal ran for several pages, with many of its entries written in the middle of the night or immediately following a nap, and were broken here and there by sketches that rambled into calculations, stray thoughts, microscopically jotted notes he could barely untangle even now. You can read the rest of the excerpt over at EW. We see in the preview that Galen is working on something involving Kyber crystals. Lucasfilm has slowly been alluding to the idea that the Death Star's weapon is powered by massive Kyber crystals, so to have him working on the seems to confirm the idea that he is responsible for the design of the super laser. 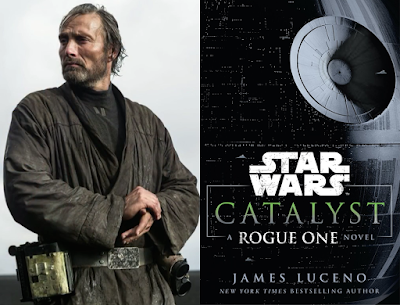 Also in Catalyst news, StarWars.com released a blog post titled "6 Reasons Catalyst is Essential Reading If You Plan to See Rogue One". Among the reasons are the news that Tarkin will be appearing in the novel and the backstory behind Jyn's relationship with Saw Gerrera will be revealed. Star Wars: Catalyst—A Rogue One Novel hits shelves on Tuesday November 15th!